Here’s another project I made with the Build-a-Banner kit. I used the Stencils included in the kit to spray patterns on notecards. (I used the Spritzer included in the kit and mix Pool Party ink with Rubbing alcohol.) 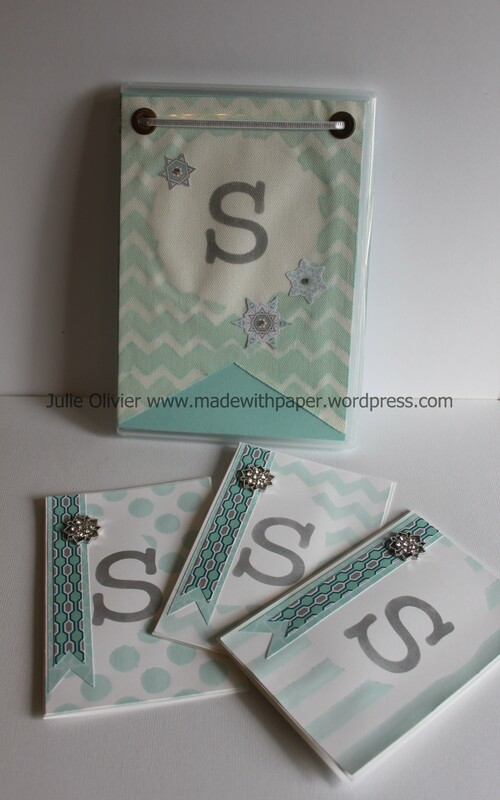 Then I sponged the letter “S” with the “S” stencil and Silver Encore Mettalic ink. 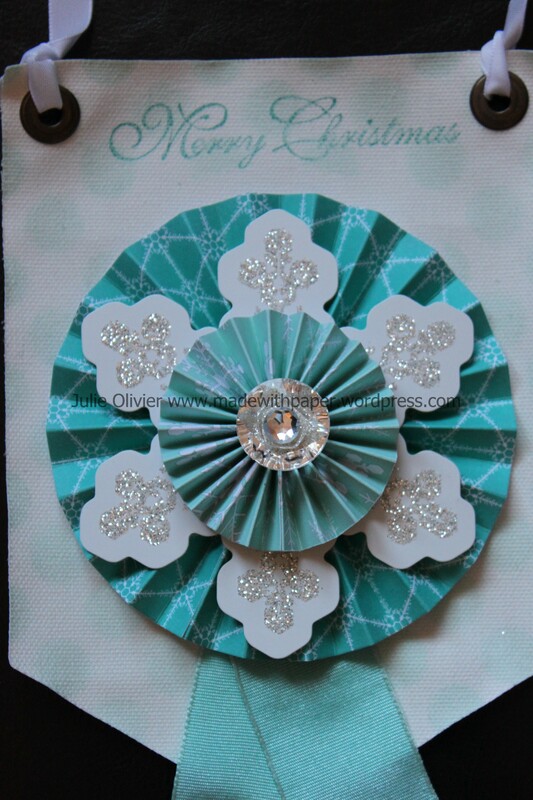 I added 2 strips of Winter Frost Designer Series paper and a Frosted Finishes Embellishment to complete each card. To make the box, I used an empty Clear-Mount Stamp Case. (You can buy the empty boxes in package of 4 for $7.50 (Item #119105). I used one of the pennant from the kit to make the front of my box. I also sprayed it with my Pool Party ink mixture and let dry. 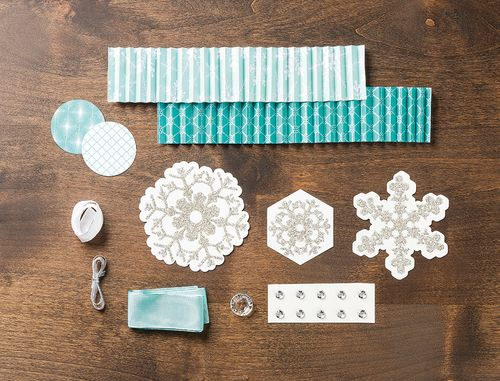 I cut some snowflake from the Designer Series paper and simply added a small rhinestone on top of each one. I finished the box with a 1/8″ Silver ribbon. 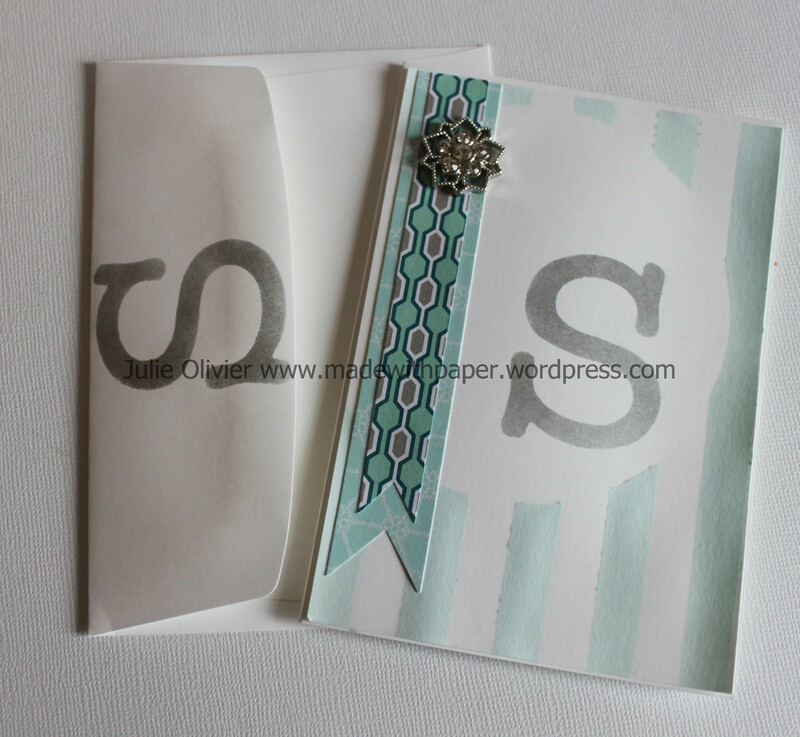 Note Cards & Envelopes, Clear-Mount Stamp Case; Scissors, Multipurpose Liquid glue, Rubbing Alcohol. Do you like banners? They are really popular right now! 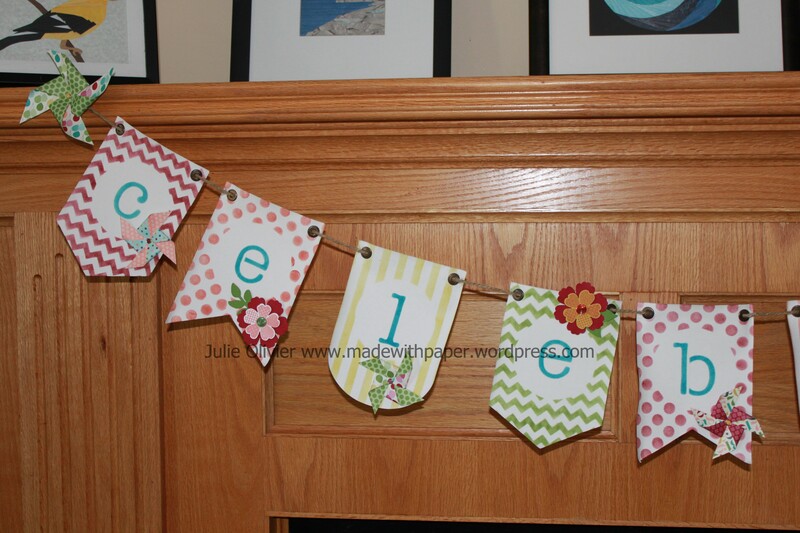 I made a banner using the Build a Banner Simply Created Kit and it was so easy! The pennants are already made for you, with eyelets. 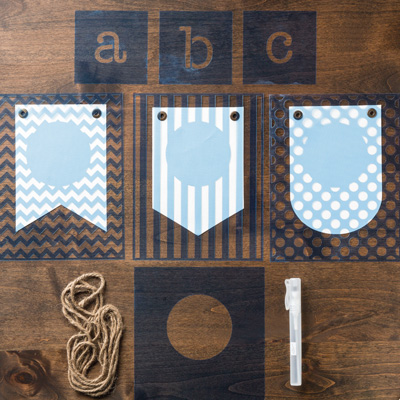 The kit comes with stencils that you can use either to spray your pennants or you can used a sponge dauber to color them. The spray gives you a lighter color and the sponging, a more vibrant color. 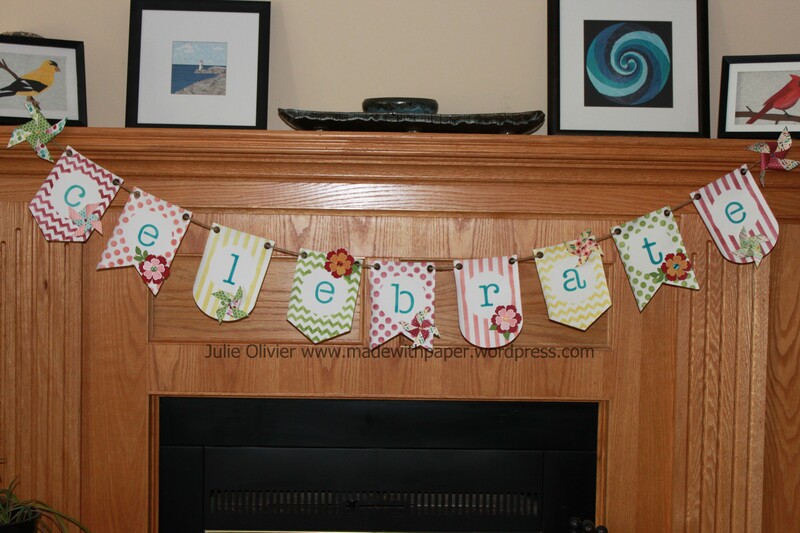 For this banner, I sponged the pennants with Raspberry Ripple, Crisp Cantaloup, Summer Starfruit, Gumball Green and Island Indigo. I made pinwheel with the beautiful Designer Series paper called “Birthday Basics”. I used the Blossom and Pansy punches to make some flowers to decorate my banner. Accessories: Candy Dots Brad base, Candy Dots Regal, Designer buttons Regal; Glue dots, Dimensionals, Snail Adhesive, sponge daubers. 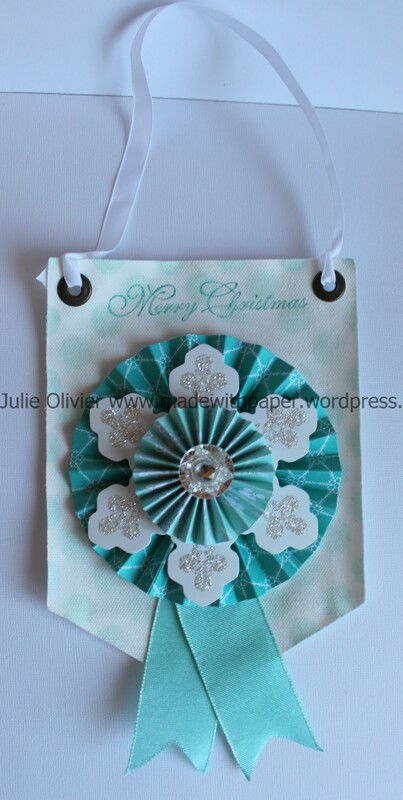 Today’s project is a Christmas decoration made with the Build a Banner Simply Created Kit and the Christmas Banner Simply Created Accessory Kit. (This is one of the project that I made for the Scrapbook and Cards Today blog (as a guest artist)). Both kits include lots of great products! Check them out! 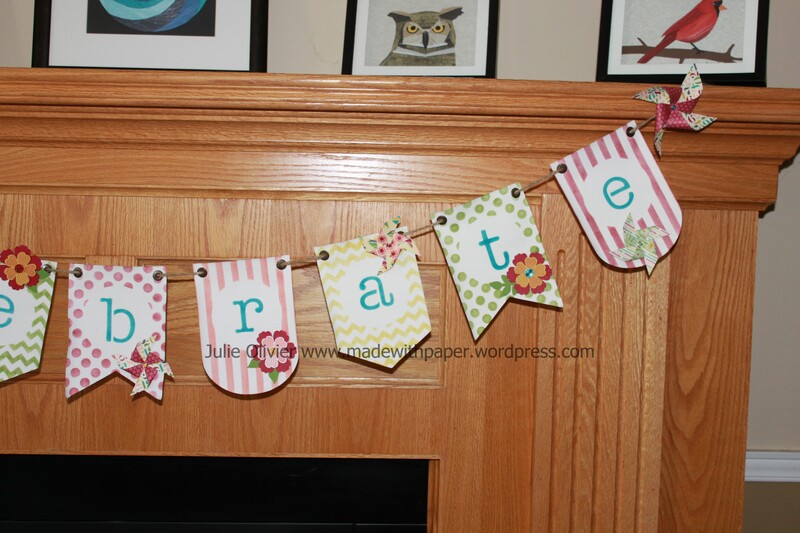 To make the decoration, I used one pennant from the Banner kit. I used the Spritzer and stencil included in the kit to spray my banner with a mix of Pool Party ink and Rubbing Alcohol. Then I used accessories from the Christmas kit, a rosette, silver sparkly snowflake, a button and a big rhinestone to make my decoration. I used dimensionals and glue dots to fix everything. It came up together pretty fast and easy! Lastly, I stamped “Merry Christmas” from “Greetings of the Season” stamp set in Bermuday Bay. Greeting of the Season stamp set, Bermuda Bay ink pad, dimensionals, glue dots.